If you or an immediate family member have been seen at our office and don't remember your portal log-in, please call our office before scheduling online—it creates a duplicate patient in our system. Feel free to give us a call, we would be happy to set up an appointment for you. If you call outside of business hours, we may not answer, but feel free to leave a message and we'll call back soon to get the appropriate details. Your 24/7 access to scheduling appointments through our online health-record portal! If this is your first time, please be aware that you will have to register an account. The registration process may not keep track of the appointment time-slot you've selected, so once you've completed registration, please ensure you have an upcoming appointment scheduled. If not, please use the button "book new visit" to schedule the appointment. You will receive a confirmation. After you've scheduled your appointment, you can feel free to get the "pesky paperwork" out of the way online, prior to even showing up! 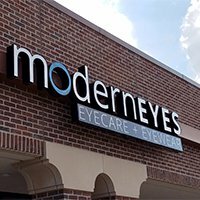 This portal will be your convenient 24/7 access to your records with ModernEyes. Like to Prepare in Advance? Here's your paperwork you can fill out at your convenience!